As the Championship season reaches it’s halfway stage, TD takes a quick look over the season so far to select a team of players that have impressed with their performances against Blackpool. Blackpool players have been excluded and only players that TD witnessed playing against Blackpool are included. Given that TD has been close to being a part time fan in the last month or so then some good players may have missed out. Missing the home games against Watford and Birmingham may have taken away two contenders for the team. Watford’s Scott Loach and Birmingham’s Chris Burke both had strong games by all acounts. However, they don’t appear here for the reasons stated previously. This is entirely subjective, without foundation in fact or deeper analysis, just the performance that was witnessed by TD. No players are in here due to reputation or achievement in other games. If that had been the case then TD’s favourite Championship player, Adam Lallana would have made the side comfortably. So without any further wiffle and waffle, here’s the side of the season so far. A strong imposing ‘keeper and TD can’t add much more than that. He’s well known and is more than capable of playing at a higher level. A willing and energetic full back who will probably never make the grade at his parent club due to their ability to recruit world class players, but would be a decent acquisition for any club from the lower half of the Premier League down to the top rungs of the Championship. A basic defender, but you know what you’re getting from him. Decent pedigree and at the time of his game at Bloomfield Road, his first for Ipswich, he looked like he could bind a very weak Ipswich back line. Similar to above, Shackell is a solid defender who does the basics well. At Bloomfield Road earlier this season he was the experience alongside the young Mark O’Brien helping to shut out Blackpool. Not many left backs have caught the eye of TD, but Taylor looked tidy and willing to push on when space appeared in front of him. Sat in front of the Peterborough defence and looked very assured on the ball and disciplined off it. Excellent on the ball, can pick a pass and deliver a ball in to the box. As with his goalkeeping colleague (Marshall), really should be playing in the Premier League. Energy personified and tactically disciplined. Functional rather than spectacular. He was at the heart of Derby’s game plan to stifle and frustrate Blackpool and chipped in with the winning goal too. An excellent target man who is powerful, aggressive and strikes the ball with excellent technique as well as rising to score with powerful headers. Very lively if a little easy to read at times (let’s ball come on to him before rolling off the defender), very hard to handle when he is running either on or off the ball. Blackpool’s high defensive line was teetering on the brink of collapse on many an occasion he was involved in the attacking play. Tricky, pacey wide man. Double footed and hard to read his movement with the ball. He may well break through at his parent club should he get the chance (next season at the earliest), should he not, then he’d be in demand from a multitude of clubs. Questions currently centre on where he will spend the second half of the season. Some genuine quality in that side and talent that can play at a higher level and also three loan players, showing how important those players are to Championship sides. A lot is made of the gulf in class between Premier League and Championship, but it really isn’t that wide at all and there’s potentially a lot of overlap between the top Championship sides and lower Premier League side. How many of these players will make the end of season side remains to be seen, with twenty three games to go it’s all to play for. Blackpool tried to hold on to a lead donated to them by a freak goalkeeping error, but in the end they invited a strong Southampton team on to them and who duly equalised to rescue a point. Ian Holloway made one change in dropping Lomana LuaLua to the bench and bringing in Chris Basham in to midfield. Whilst Nigel Adkins brought back Rickie Lambert from injury to lead the line and Bartosz Białkowski for the injured Kelvin Davis in goal. Blackpool set up in their 4-3-3 with Basham adding extra bite and cover in the midfield. Southampton on paper looked like a rough 4-4-2 but with plenty of fluidity about it. Both their wide men cut in, their central midfielders sometimes split and Guly Do Prado dropped off Rickie Lambert to receive the ball in between Blackpool’s midfield and defence. Blackpool appeared to set up to counter when under pressure and to assert themselves on the ball should they win it higher up the pitch. This was initially aided with pressure being applied high up the pitch, trying to throw out Southampton’s passing moves from defence. 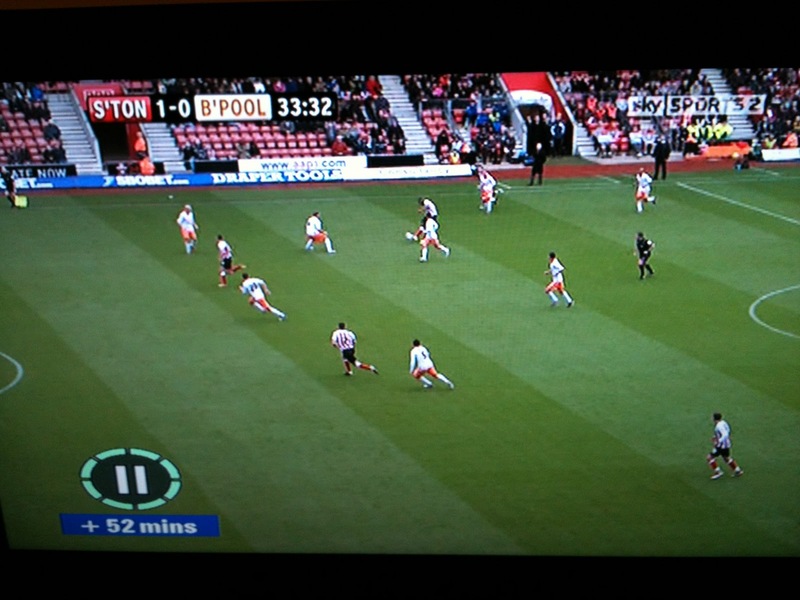 Southampton appeared to be happy to allow Blackpool the centre ground and go around them and with a mixture of short and long passing. They were aggressive in attack and had plenty of drive from their midfield to run beyond attackers and in behind the defence. They focused their attacks on and around Lambert, using him to set plays up as well as to bully the Blackpool defence and force them deeper. 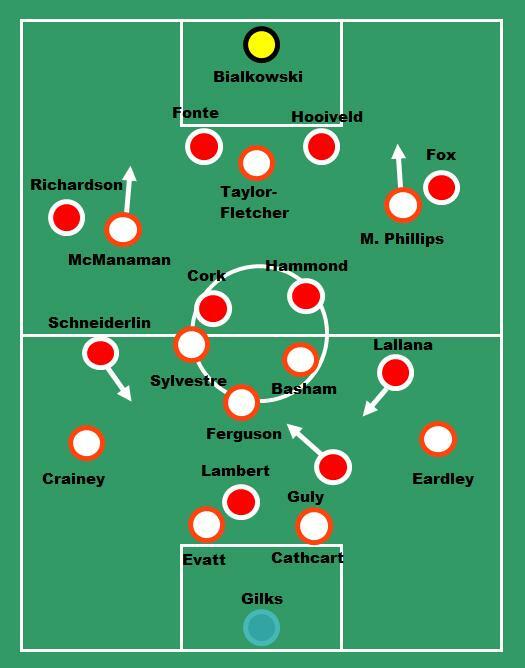 The first half swung from Blackpool to Southampton and then back to Blackpool again as both teams enjoyed periods of dominance. In truth, Southampton had the best of the chances in the first half, but their defensive work was unhinged by the mistakes being made by Białkowski in goal. His nerves or even lack of alertness caused gave Blackpool more joy than they perhaps should have had and Southampton’s back line seemed a little thrown off by that. 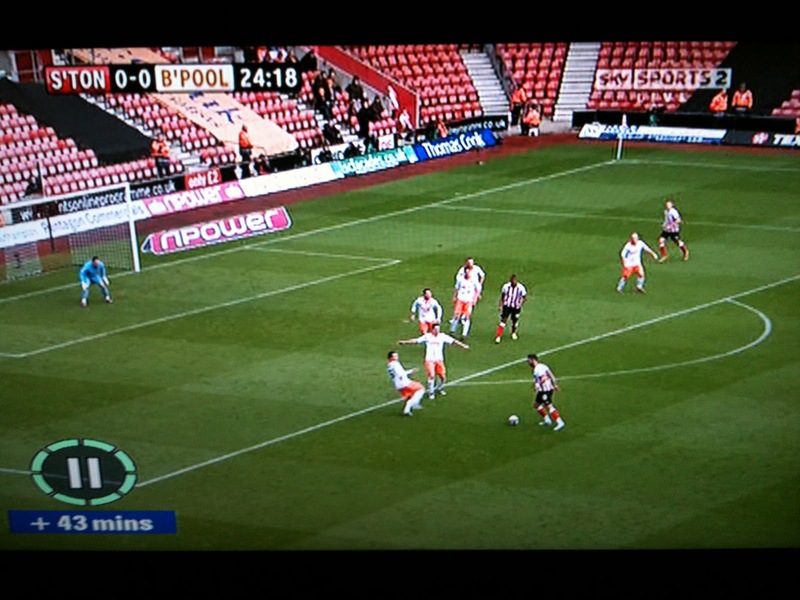 The mistake by Białkowski for the second Blackpool goal seemed to throw the game in to a stunned state before Southampton started to chase the game. Blackpool at times used the ball very wisely, however, as the game wore on the ball started to come back to them all too often as they lacked a genuine out ball to set up counter attacks or field position. When Blackpool enjoyed their best spells they were usually aided by strong running on and off the ball by Matthew Phillips and Callum McManaman which stretched the play, pushing the Southampton defence back, creating space for Blackpool’s midfielders to step in to and receive the ball. Southampton looked more fluent when Adam Lallana stepped inside and forward to join the attack. However, to Blackpool’s credit that happened very little, however, when it did, he caused them a lot of problems. The first goal came from Lallana pressure and link up play. 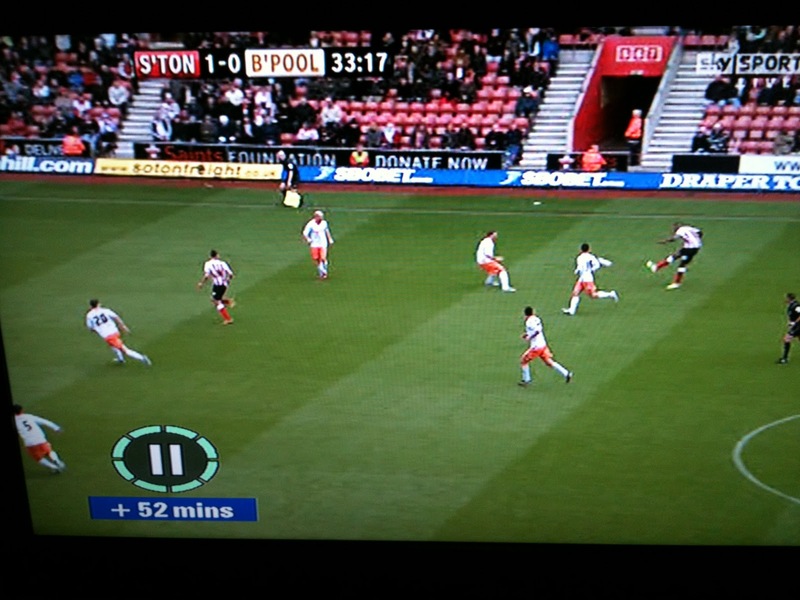 What was noticeable about Southampton off the ball was the inconsistency of their pressing. They didn’t seem to press with a consistent intensity or in consistent patterns. If this was intentional then fair enough, however, it would be strange if that was the case. When they stepped up their pressing before the first goal it really appeared to catch Blackpool out who found their space shut out and struggled to work in the tighter spaces. Holloway’s team conceded late on in the game, but in truth they invited it. If it was a conscious decision then it was only executed in part. The key in such situations is to do the basics well, blocking, tackling, keeping shape etc, but it’s vital that the pressure can be eased with ‘outballs’ that remain up the field of play for as long as possible. 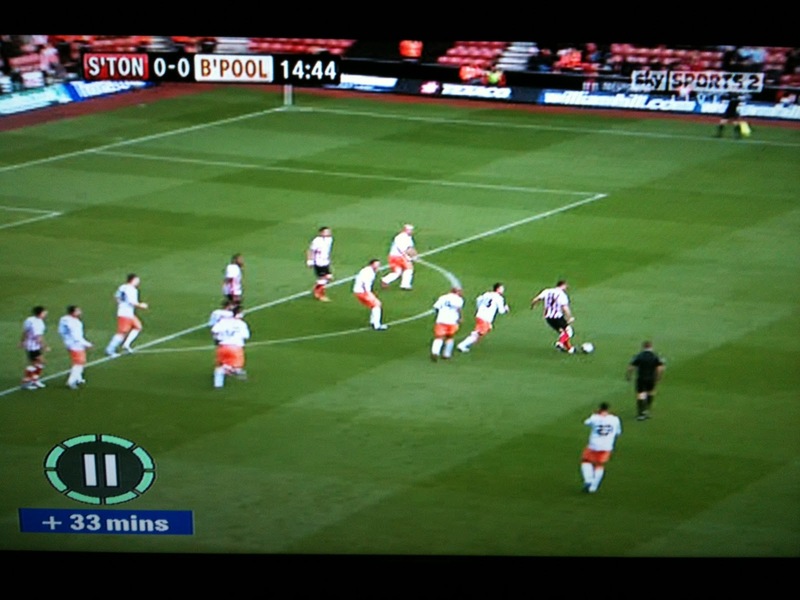 In this case Blackpool struggled to lock down their out balls, either through poor distribution or hold up play. The net effect was that Southampton were in receipt of the ball time and time again, giving Blackpool more and more pressure to handle. Southampton are a top Championship side and it showed in this game. Their goalkeeping issues aside (assuming Kelvin Davis isn’t out for too long) they have everything they need to be promoted. Defensively sound, but it’s their attacking options that sets them apart. Admittedly a lot of their plays hang off or come through Rickie Lambert, but they aren’t entirely dependent on him. They have excellent variety to their game. They can pass short and long in all areas, they can build play and have players to thread short balls in the final third, but will go long from front to back to exploit the aerial qualities of Lambert. They vary their player positions to suit themselves, in this game alone there was a lot of position switching within their framework. As attacking plays go they have some great pre-set moves. As good example of this is the long ball from full back or centre back to the head of Lambert who will flick on to an oncoming wide midfielder cutting in. It’s hard to track the midfield runner and Blackpool struggled at times. When Lambert executes his flick well the opposition defence is turned around in an instant and the goal is exposed. In this game they also had another element to their attacking play and that was the movement of Guly. He drops off deeper to receive the ball to feet which helps to vary their focus of attack and he can start short passing movements with support from the central midfielders, but also from Lallana who will drift inside to receive. There may be questions over their dependency on a couple of players, but that is clearly a risk worth taking as they appear so strong in utilising them well. Should Lambert get an injury that keeps him out for a long time then perhaps they may struggle, but with such variety to their game they should cope. Blackpool will be happy with the point, even if they won’t be happy with allowing Southampton to attack them so frequently towards the end. They move in to the festive period with the potential to emerge in January in the play off positions. Nigel Adkins will be happy with the character shown by his team and should have little concern about where his team are heading. The weather set the tone for the occasion on Saturday, with the damp and blustery conditions playing their part in a forgettable day. 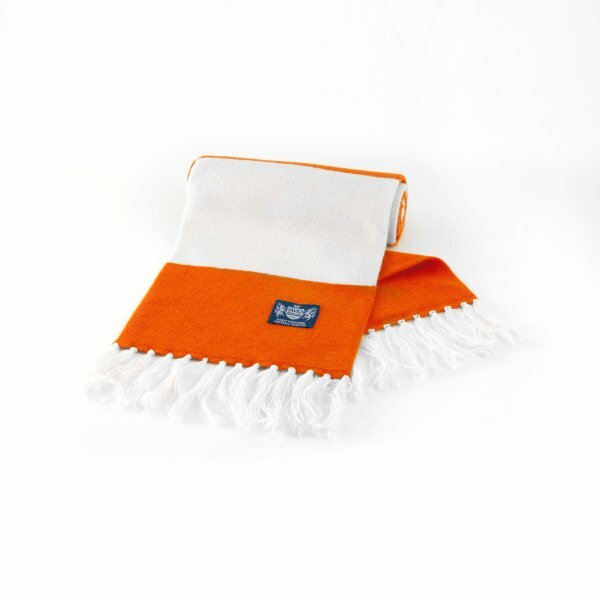 As part of a pre-match preview for the Reading blog The Tilehurst End, I tipped a narrow Blackpool win and advised Royals’ fans to brace themselves for inclement weather. If nothing else, I hope they at least followed my advice and wrapped up warm, as there was little other comfort to be taken from their long journey north. The first half was particularly uneventful, as neither side really got going – stray passes were the norm and the main action centred on two refereeing decisions. Lomana Lua Lua’s through ball found Callum McManaman running through on goal, only for him to be felled outside the box. The referee gave no decision, when surely it was either a professional foul from the Reading defender or a bookable offence for a dive from McManaman. At the other end, Reading had a goal ruled out for offside – Matt Gilks saved well from a header following a free-kick, and although the rebound was poked in, the flag went up. It was a marginally better second half, but still not enough to elevate the game above anything other than dull. One good five minute spell for ‘Pool brought the winning goal, when Matt Phillips charged down the left before finding McManaman in space just inside the Reading box. A sharp turn created just enough space for a shot and McManaman found the corner to hand ‘Pool all three points. It may not have been pretty, but in the end Blackpool did enough and once ahead never really looked like succumbing their advantage. Over the course of a successful season, victories like the one over Reading are vital, and winning in this fashion from time to time should be commended. As one of the many teams aiming for a play-off finish this season, Reading’s trip to Bloomfield Road should have been an entertaining encounter between two teams vying for the same goal. However, without the injured Noel Hunt and the influential Jobi McAnuff, who was suspended having picked up his fifth booking in the 3-2 win over Peterborough, Reading were something of a let-down. Reading may have a case to claim they had just about the better of the opening 45 minutes, but ultimately the visitors created very little. Attacking down the flanks appeared to be the most obvious gameplan, but with poor delivery from crosses, Blackpool were more often than not able to clear quite easily. Set-plays provided Reading with their most dangerous moments of the match though, with the disallowed goal coming from a free-kick in the first half – defending set-pieces can be a weakness for ‘Pool, but Reading were unable to make the breakthrough. This is by no means a bid to write Reading off however, and it may simply be an off day for them, not helped by the absence of key players. Inconsistency is rife in the Championship and it’s entirely plausible that the return match will look like it’s being contested by two completely different teams. There is no doubt that Reading will play better this season, and even then they were only just edged out on Saturday. 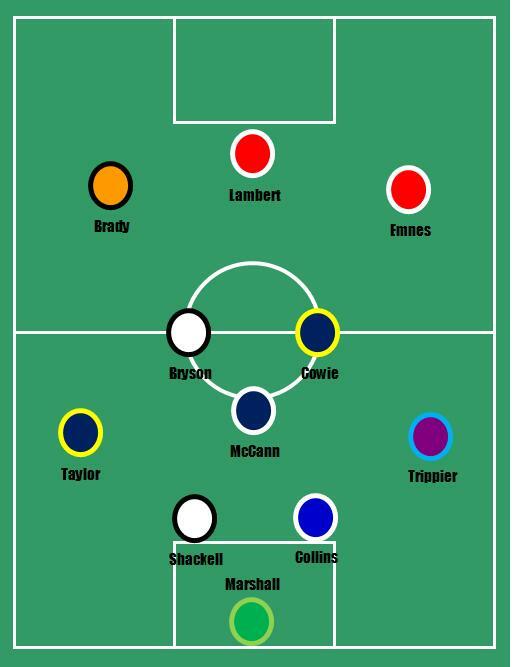 The starting line-up saw Gary Taylor-Fletcher restored to the midfield, with McManaman earning a recall in the front three alongside Lua Lua and Matt Phillips. Taylor-Fletcher has of course filled this role already this season with varying degrees of success, and it was another mixed display for the midfield as whole. The same fluency that appeared to accompany the trio of Barry Ferguson, Keith Southern and Ludo Sylvestre was not quite there against Reading. A major reason for this, is that with Taylor-Fletcher in the midfield, he will often push forward to make it into a midfield two and forward four. It was often a similar story when Jonjo Shelvey occupied that role, and makes you wonder if it has been a conscious decision from the management. Having this option alongside a flatter midfield three makes ‘Pool flexible and a bit harder for other teams to predict, but does mean the short passing game of the midfield is a little more neglected. As the second half wore on, Matt Phillips dropped into the midfield with Taylor-Fletcher swapping places, and while it was effective in one sense, with Phillips running from deep to provide an assist, it is not an arrangement that one can envisage being used very often. As the substitutions were made, both Chris Basham and Angel were used in a more defensive-minded midfield, and their presence helped close out the game. One wonders if Ian Holloway may use either of these two players alongside Ferguson and Sylvestre in a return to flat a midfield three in the coming weeks, particularly away from home. If not, then it is likely to be Taylor-Fletcher who will continue in what is becoming a more familiar role for him. It has been a reflective week or so for football in light of the news of Gary Speed’s untimely passing, and Blackpool supporters had another reason to put things into perspective when Keith Southern’s troubles were revealed. It emerged before the Reading game that Southern had had an operation to remove a tumour from one of his testicles. Results from the biopsy are as yet unknown, but it is believed the operation went well and Southern himself is targeting a return to training in January. The longest serving player at the club has a tremendous attitude towards the game, and despite not being blessed with an awful lot of on the ball talent, his work ethic and determination has seen him be an almost ever-present name in the Blackpool team for the best part of a decade. Even now his absence is keenly felt, the midfield losing a key ingredient without him in the side. It is to be hoped his recovery is as successful as it is swift. Our thoughts are with Keith and his family and hopefully we will see him step back out at Bloomfield Road in the not too distant future.